– Try swapping out a regular bar for a towel when doing vertical and horizontal pulls. – DB Crushers – 3 x 10 at the end of your session. Grab a DB and let it roll to your fingers. Wrap your fingers around it and squeeze it to get it back to your palm. – Towel chin ups. 3 x AMRAP (as many reps as possible) as your main set. As much rest as needed between sets. SUPPORT: Any exercises where you’re supporting the lift with your fingers. Think deadlift and carrying variations as part of your main training set. – Rack Pull to 10 second hold. 3-4 reps, 5 sets. – Trap Bar Deadlift to Farmers Carry – try a 10-1 ladder with 30m carry between. 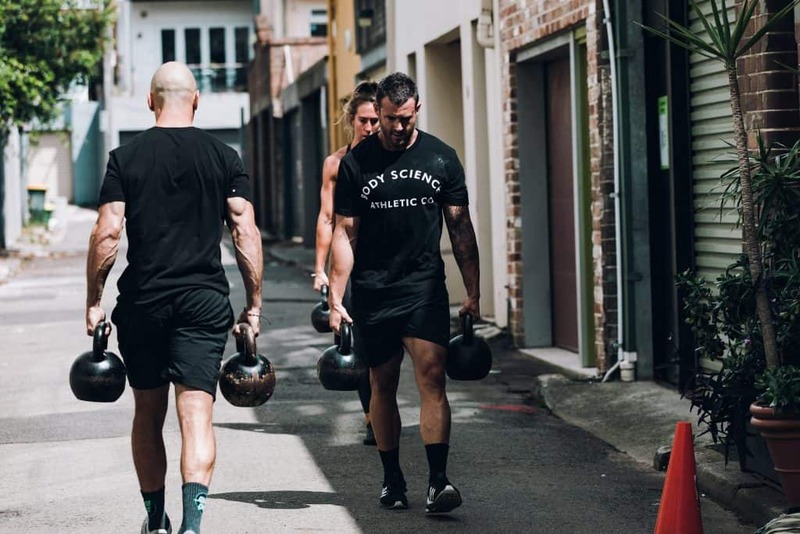 – Farmers Carry – 60 secs on/60 secs off. 6 rounds. – Dead Hangs – try 30 secs Dead Hang/30 secs Kettlebell Swing x 6 rounds. PINCH: A static contraction that focuses on the strength and endurance of the digits. This is one way to ensure your fingers can do the walking. – Plate Pinch. With thumb on one side and 4 fingers on the other, hold and squeeze the plates using your fingertips. 4 x ALAP (as long as possible) at the end of your session. WRIST STRENGTH: I’m always yelling at people in the gym, especially when it comes to exercises using Kettlebells, to “stop letting the weight just hang off their wrist”. This is something you’re probably doing without even realising it. If you’ve ever swung a sledgehammer or gripped a hockey stick, then you’ve used wrist posture. This is great for solid forearm growth gains. – Dumbbell Reverse Wrist Curls – 3 x 10 at the end of your workout. HAND HEALTH: Just like the foot is your proprioceptive HQ from the ground up, your hand leads the way when it comes to what the rest of your upper limb is doing in space. Soft tissue work on the hands and forearms (if you’ve got a lacrosse ball, you’ve got a trigger point ball), and increasing your finger dexterity is key – try rolling golf balls around in your hand. A rubber band a day keeps the physio away: The muscles in your hands and forearms need balance just like the rest of your body. For every flexion exercise, you need one for extension. Grab a handful of rubber bands, loop them around your hand and splay your fingers resisting the tension. Hold for 2 seconds and relax. A couple hundred reps a day should do the trick, so pop some in your pocket next time you get the chance. Under or Over. In my opinion, too many people switch to a mixed grip when deadlifting, either through bad habit or when the volume kicks in and the going gets tough. The more you pull double overhand, the more gains you’ll make in the long run, and not just in your deadlifts – strength in the double overhand grip translates more effectively over into your other main lifts like pull-ups and rows. Squeeze: Every time you lift a weight or hang from a bar or carry an item is an opportunity to crush it, as opposed to just holding it. A strong grip translates to more tension, more strength, and more muscle. But only if you actually use it. So grab the weight like you mean it. It’s literally all in your hands now. Do your usual exercises, but wherever possible, fatten the grip. The fatter, the grip, – the more motor units recruited. You can buy specialized FAT GRIPS or you can simply wrap a towel around the bar/weight.